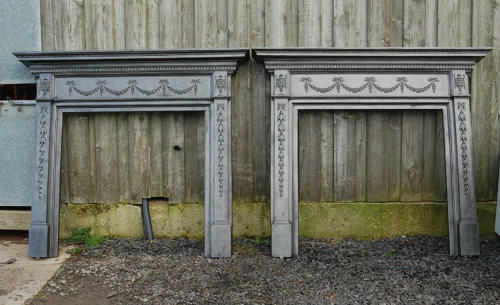 Two matching, large and decorative, Victorian cast iron fire surrounds. The surrounds are grand and imposing and would add great character to a living or dining room. The painted surrounds have an Adam style design with swags, bows and urns, that are typical of the style. The fire surrounds are heavy and solid, with a large mantel. The mantel has decorative borders below it and the fire has a linear border around the fire opening. The fires are in very good, solid condition and are well constructed. The fires are antique and therefore have some signs of wear consistent with age. One fire has one broken and one missing side fixing lug. We can repair the fire by adding simple lugs for an EXTRA CHARGE. The second fire has the fixing lugs intact. The casting lugs are present at the bottom of the legs. The fires are painted black but we can strip the fires and paint white, if desired, for an EXTRA CHARGE. Please let us know at time of purchase if you require us to repair or strip the items. There are some marks and knocks consistent with age but no major damage or significant wear. One fire has some paint splashes to its leg. The fire backs have surface rust as expected. The fires are of a fanatstic design and have a very pretty look, ideal for a Victorian home. A pair of fires in such good condition is rare and the surrounds are highly desireable.